Flying rc airplanes and helicopters has become a hugely popular pastime in recent years, and more and more people are discovering the hobby on a global scale. The letters RC stand for radio control, and refer to anything that is controlled by radio signals that are sent out from a transmitter to a receiver. You’ll often see rc referred to as ‘remote control’ but this is technically incorrect. Radio control is the correct term. RC airplanes and (especially) rc helicopters have traditionally been expensive to buy, and you had to have a fair amount of model-building knowledge to know how to assemble a kit from plans, not to mention knowing how to install the radio control gear properly and of course the motor. But all that has changed and, while kits are still available of course, airplanes and helicopters nowadays can be bought as ‘RTF’ models, or Ready To Fly. This basically means what it says; the model is assembled at the factory, the rc gear and motor have been installed and set up and there is nothing for you, the consumer, to do apart from install the radio control gear batteries, do some very basic final assembly work such as attaching the wing to the fuselage, and taking to the skies! RTF airplanes and helicopters can be powered by either electric or glow plug motors. The latter is often referred to as ‘nitro’ or ‘gas’ because the fuel that a glow plug motor runs on contains nitromethane. Nitro planes need a few extra accessories than electric ones do, simply because of the motor. Also, nitro planes are much bigger and have a steeper learning curve. Electric rc airplanes are far more common for people entering the hobby. They are clean, quiet and simple. The very popular ‘Park Flyer’ style electric planes are bringing thousands of new rc pilots into the hobby because of these reasons. Also, they are cheap to buy; a simple 1 or 2 channel RTF model can be bought for well under $100! Because they are quiet and small, they can be flown in any decent-size open area, hence the name Park Flyer. Public parks, sports fields or empty parking lots can all be used as flying space, provided that flying rc airplanes there is allowed in the first place! The best type of airplane to buy if you’re first starting out is a high wing trainer type. Airplanes with the wing on top of the fuselage are much more stable than ones with the wing underneath. Another important point to look for is the amount of dihedral the model has. Dihedral is the upward angle of the wings when looking at the model from the front. The more dihedral an airplane has, the more stable it will be in the air, and hence easier to fly. The majority of electric RTF rc airplanes are high wing, and are designed for beginners into the hobby. The same rule applies to nitro airplanes. High wing trainers with plenty of dihedral always make good beginner planes. The big difference between nitro and electric airplanes is where you can fly them. Electric ones can be flown in public places, but nitro planes can really only be flown at a model flying club, or on private land with the owners permission. This is simply because they are bigger, noisier and faster than their electric cousins. Also, this makes nitro airplanes harder to learn on because there is more to think about. So if you want to get into the hobby of radio control flying, and want to jump in at the deep end with a nitro model, seeking out your local model flying club is the best thing that you can do as a first step toward your new pastime. The above information goes for rc helicopters too. In fact, electric rc helicopters have really changed the hobby, because they have become so much cheaper to buy than they ever have been, and many nowadays are designed for the complete beginner. Even if you’ve never held a rc helicopter before, you can very quickly be mastering the controls of an electric model heli without too much trouble. Some even come with their own flight simulation software – just load it onto your home computer and practice first, without running the risk of crashing your model! There are literally hundreds of models to choose from these days (airplanes and helicopters), but always be sure of what you’re buying first. Check out reviews if you can find some, and be happy that the model is suitable for a beginner. It is more durable and like a rubber material comparing to the white beaded EPS foam. It is white coloured foam available in two different weight densities: 1.3 Ib/ft3 and 1.9 Ib/ft3. 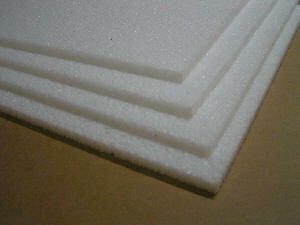 Because of it belongs to a type of molded foam, it has a higher density at the surface than the core of the material. Such variation in density distribution causes the hot-wire cut EPP foam sheets being slightly heavier than the sliced sheets. EPP beaded foam is also a type of ‘shape memory foam’ that it returns to its original shape after being distorted mechanically. Despite that EPP foam was originally developed for impact absorption (e.g. bumpers) in the automotive industry, it is widely use today for building the wing and fuselage sections of RC combat aircrafts. Unlike the EPS foam made model aircrafts, EPP foam models are not suitable for covering with balsa sheets. EPP foam made model aircrafts are often to be covered with tape or a low temperature heat-shrink finishing (e.g. Ultracote). However, EPP foam does has a waxy feel that it really needs to be sprayed with 3M adhesive before applying finishing materials such as the fiberglass reinforced tape or plastic firm. Overall, EPP foam stands on its own probably as the toughest foam that is excellent in withstanding compression, but weak in that for tension loads (i.e. it will tear in tension and requires strapping tape for reinforcement). It is also not as easy to mould due to its high toughness. 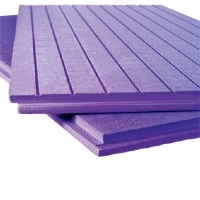 It is often identified by the trade name ‘Styrofoam’ though it is also being known in the UK as ‘Blue foam’ or in France as ‘floormate’ or ‘roofmate’. It is available in a variety of colours like blue, gray, orange, green and pink colours. It has a fully closed-cell structure (i.e. which means that each cell that makes up the structure is completely closed off from adjoining cells which prevents it from behaving like a sponge) that helps the foam to resist moisture penetration and water retention better than other types of foam materials. Such closed-cell structure also contributes to the long-term durability and strength of the foam material. When the foam is used for building wing cores of model aircrafts, this closed-cell structure is giving the item a much finer trailing edge. Meanwhile XPS foam is lightweight (i.e. available in density of ~ 1.0 Ib/ft3) and can easily be well covered by painted finishing. However like many other foam materials, XPS foam is combustible. 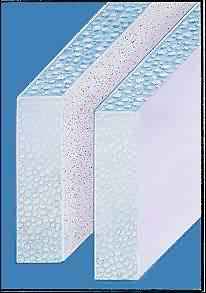 It has a partially closed-cell structure that allow water infiltrate through capillary action and water retention in the foam’s interstitial voids. Compared to the XPS foam, it is heavier (i.e. with density of ~ 1.3 Ib/ft3) and does not cover as well with painted finishing. However it is cheaper than the XPS foam.